Summer vacation is over and school starts Wednesday. Our daughter starts high school this year... time sure flies! 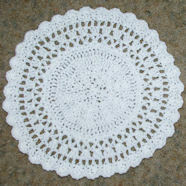 I am looking for a doily that I think is called Dogwood Blossom and Pineapple design. It is an old pattern and has a dogwood blossom in the center, a circle of pineapples and then a circle of dogwood blossoms on the out side. 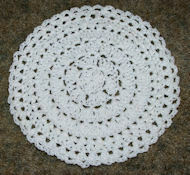 My aunt that I am named for made this doily years ago and I would like to make one. I wonder if this is the doily you had in mind? I'm sorry to say I've only found the actual doily for sale... not the pattern. the joy that springs in a heart that is in love with God. If I give all I possess to the poor and surrender my body to the flames, but have not love, I gain nothing. Love is patient, love is kind. It does not envy, it does not boast, it is not proud. It is not rude, it is not self-seeking, it is not easily angered, it keeps no record of wrongs. Love does not delight in evil but rejoices with the truth. Love does not delight in evil but rejoices with the truth. It always protects, always trusts, always hopes, always perseveres. Love never fails. But where there are prophecies, they will cease; where there are tongues, they will be stilled; where there is knowledge, it will pass away. 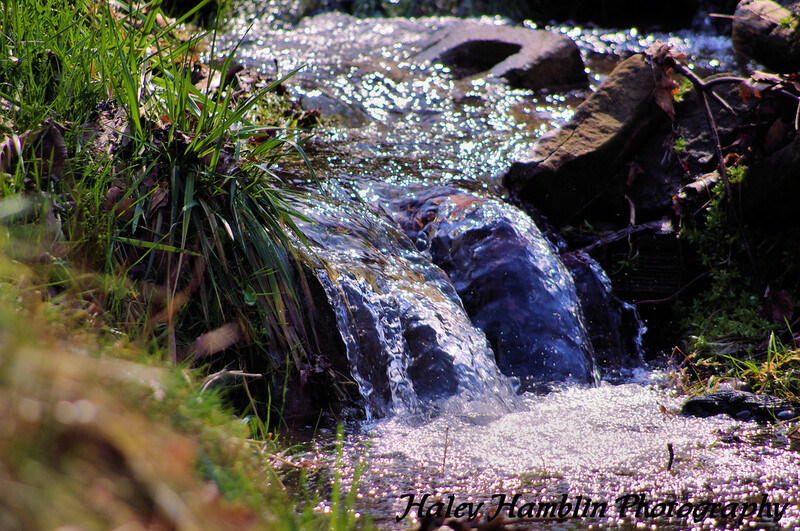 UNITY IN THE MIDST OF DIVERSITY ." Who was the son of Shaphat? number/series of chains. Ch-1 sp is the same as chain one space. Ch-2 sp is the same as chain two space. etc. Anytime a pattern calls for working into a chain space you work into the hole left beneath the chain(s)... not into the chain(s) themselves. Take a second to thread a yarn needle. Sewing the ends into your project is a lot faster than using a crochet hook and it keeps the crochet fabric looking much nicer. Thank you so much Lisa!! 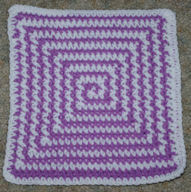 The dishcloths are very pretty! I like your website. I was wondering if you have any easy slipper patterns for crocheting. Thanks. Hope you find a pattern here you will enjoy. This is the only place I can access you. I am enjoying your website so much. Enjoy the patterns, etc. A friend recommended your site. Re: Flower Tote - the flower on it. What does csp on R2 stand for. I can't find it in your directory of abbrevs. I want to use the flower. Thanks for sharing the word of God with everyone. Csp... was a typo. It should read "ch-sp". Thank you for letting me know... this is has been corrected on the pattern page. I just found your site. I really love some of the patterns you have, I have been looking for some of them for a long time. 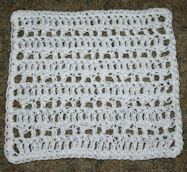 I have been crocheting for about 35 years and still love it. I also want to applaud you for sharing your faith. God Bless you. 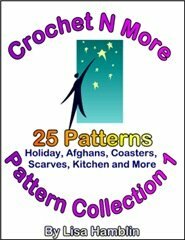 I love your website as your crochet patterns are pretty easy to do and read. 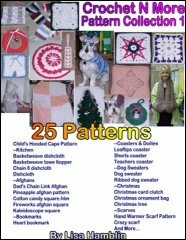 I have done a few patterns and often refer to different links and have suggested your site to friends. Thanks for offering easy patterns. what is a hump? I normally single crochet into a chain, pushing the hook through 2 strands of a chain link. Is a hump just one strand of the chain link? as well as a little hump on the back side. the edge of the first row look like the edge on the last row. I am still not getting your newsletters like when i was through yahoo. I resigned up with my new email address and i have also added you in my address book. I really miss your newsletter and all the tips. Is there something else i need to do? Thank you for your time. will not let me add this address back onto the list. Re: Looking for an afghan stitch hook size N.
I believe the designer means “row”. Would this make sense in your pattern? I just found your floppy brim hat pattern – it’s adorable. My oldest friend in the world has just been diagnosed with cancer and has tasked me with making her some cotton hats for when she looses her hair. She likes the floppy brim hat I sent her for Christmas for her cold Denver winters. She wants cotton...can you suggest how to make your hat with cotton thread? I’m not an expert and time is key. We do not charge money to list prayers for people. What made you think that? The site that I clicked on on the news letter requires money if you want to submit a request for prayer. All it takes to have a prayer listed is email it to me. There are advertisements on all of our webpages. Could it be you clicked on one of those? has searched for in the past. Thanks for letting me know Cathy. Yes... that is sad that people would try to profit off of another person’s need for prayer. I wish I could remove certain ads from the rotation myself but that’s not possible with that ad program. I plan on including your note in my next newsletter in hopes of informing others that we do not charge for prayer. Have a great week! When I asked him if he wanted the earrings gift- wrapped, he said, "That'd be great. But can you make it quick? I forgot today was my anniversary, and my wife thinks I'm taking out the trash." Mrs. Brown, an English teacher, allowed her car roll through a stop sign and was immediately pulled over by an alert young police officer. The officer was a former student who immediately recognized the errant driver. He couldn't resist saying: "Mrs. Brown, a stop sign is meant to be a period, not a comma!" "Well, I knew sooner or later somebody would ask me, so I measured it!" A man traveling in southern Indiana was headed for the Kentucky border...when he saw a large sign..."LAST CHANCE FOR $3.79 GAS!" He still had more than a quarter of a tank left, but figured he'd better take advantage of this opportunity to fill-up his tank at $3.79. As he was getting his change from the attendant, he asked, "How much is gas in Kentucky?" There was a Christian lady who lived next door to an atheist. Everyday, when the lady prayed, the atheist guy could hear her. He thought to himself, "She sure is crazy, praying all the time like that. Doesn't she know there isn't a God? "Many times while she was praying, he would go to her house and harass her, saying "Lady, why do you pray all the time? Don't you know there is no God?" But she kept on praying. One day, she ran out of groceries. As usual, she was praying to the Lord explaining her situation and thanking Him for what He was gonna do. AS USUAL, the atheist heard her praying and thought to himself. "Hmph . . .I'll fix her. "He went to the grocery store, bought a whole bunch of groceries, took them to her house, dropped them off on the front porch, rang the doorbell and then hid in the bushes to see what she would do. When she opened the door and saw the groceries, she began to praise the Lord with all her heart, jumping, singing and shouting' everywhere! The atheist then jumped out of the bushes and told her, "You ol' crazy lady, God didn't buy you those groceries, I bought those groceries! "Well, she broke out and started running down the street, shouting and praising the Lord. When he finally caught her, he asked what her problem was . . . She said, "I knew the Lord would provide me with some groceries, but I didn't know he was gonna make the devil pay for them! In the traffic court of a large Midwestern city, a young lady was brought before the judge to answer for a ticket given her for driving through a red light. She explained to his honor that she was a school teacher and requested an immediate disposal of her case so she could get to the school on time. A wild gleam came into the judge's eyes. "You're a schoolteacher, eh?" he said. 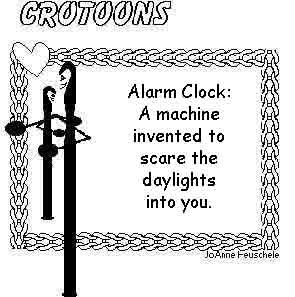 "Madam, I shall realize my lifelong ambition. I've waited years to have a schoolteacher in this court. Now sit down at that table and write 'I will not drive through red lights' 500 times!" A customer moves away from a bank window, counts his change, and then goes back and says to the cashier, "Hey, you gave me the wrong change!" "Sir, you stepped away from the counter," said the cashier. "We don't make corrections after you leave. There's nothing I can do about it now. That's the policy of this bank." "Well, ok," answered the customer. "Just thought you'd like to know that you gave me an extra twenty. Bye." My son Ward owns a shiny green four-wheel-drive truck. He also owns a 110-pound black Labrador named Tony. On trips, the dog generally sits on a platform behind the driver's seat, resting his huge head on Ward's shoulder as they travel cheek-to-cheek. Ward did not give this cozy arrangement a second thought until the day he took Tony with him on a trip to Montana. While listening to his CB radio, Ward overheard one trucker remark to another, "See the little green four-wheeler you're about to pass? When you go by him, take a good look to see if that ain't a dog driving." A man is waiting in line for a hit movie. Behind him are two women. The usher comes along and says that he has two seats together. Seeing the problem, the usher says to the man, "Let them go first. You wouldn't want to separate a woman from her mother, would you?" The man says, "No, sir. I did that once, and I've been sorry ever since." The Aggie replied, "Sir, I believe that would be giddy- up."